The BOSS EXT is built with all of the toughness and innovation you expect from BOSS products. 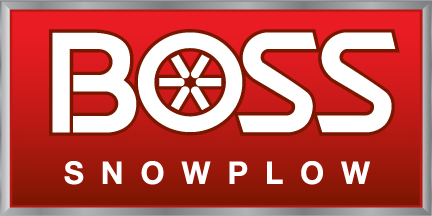 With expandable wings that enhance productivity and efficiency to put winter in its place, BOSS built in a blade-leveling feature to accommodate the variations of push beam heights. Because the wings on the EXT sit forward at a 20-degree angle, you need the ability to adjust the angle of the moldboard to ensure the cutting edge is scraping across the width of the blade, including the length of the wings. This will also reduce any chattering caused by the blade not sitting level. Push beam height is crucial to keeping the push frame level while plowing. Equipping a vehicle with an in-bed spreader will also greatly vary push beam height. The 15-1/2” push beam height should be set up with the vehicle in normal plowing conditions, i.e. full v-box hopper spreader, ballast, tailgate spreader, etc. The second set in ensuring your blade is level is to adjust the cam stops. BOSS built in a feature to perfect the blade level with our adjustable Cam Stops. There are four Cam Stops located on the backside of the main blade. By turning the cams, you can adjust the angle of attack to level the cutting edge, ensuring it makes contact with the ground for optimal scraping performance. 1. Park the vehicle on a level surface and lower the plow completely. If the plow is not flush against the ground, adjust the angle of attack. 2. Loosen the trip springs. 3. 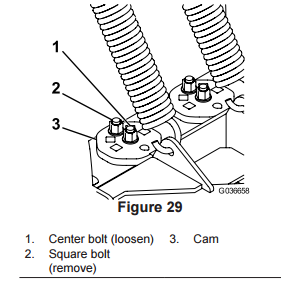 On the cams, remove the bolt in the square hole and loosen the bolt in the center (See Figure 29). 4. Rotate the cam clockwise to angle the bottom of the blade back. Rotate the cam counterclockwise to angle the bottom of the blade forward. *Use a 1/2 inch ratchet to help rotate the cams. 5. Insert the previously removed bolt, and torque it to 76 N-m (56 ft-lb). 6. Tighten the center bolt, and torque it to 76 N-m (56 ft-lb). 7. Tighten the trip springs until there is a gap of 0.8 mm (1/32 inch) between the trip spring coils. Watch the video below as a quick reference about the BOSS blade-leveling feature. Once the push beam is set and the cams have been adjusted, the last step is to adjust the wing urethane edges. 1. Loosen three bolts on the front of the cutting edge and three bolts on the side. 2. Adjust the cutting edge to approximately 1/8” off of the ground. 3. Tighten all six bolts, securing the cutting edge. If you have any questions throughout this process, please contact your local BOSS dealer or our Technical Service Department at 800-286-4155 ext. 2.